Jack likes trucks. Alex likes dolls. What will they play together? Their new favorite game, of course! Ann Stott is the author of What to Do When You’re Sent to Your Room, illustrated by Stephen Gilpin, and Always and I’ll Be There, both illustrated by Matt Phelan. She is also an art director and children’s book designer. Ann Stott lives in Newburyport, Massachusetts. Bob Graham has written and illustrated many books for children. Among them are Home in the Rain, How the Sun Got to Coco’s House, Vanilla Ice Cream, and “Let’s Get a Pup,” Said Kate, which won a Boston Globe–Horn Book Award. He lives in Australia. Stott's (What to Do When You're Sent to Your Room, 2014, etc.) simple prose focuses on the interaction between Alex and Jack, which leaves room for readers to interpret who the children are based on the illustrations. Neither child ever receives gendered pronouns...the story conveys a positive message about inclusiveness and compromise. This lighthearted story embraces the freedom of imaginative play. Graham’s familiar airy line and watercolor art brings the story to distinctive and cozy life, making it all part of a plausible park outing with moms chatting on the bench behind the boys and the individualized passersby, in a fully representational cast, clearly having their own rich lives. It’s that dip into Graham world that really makes this a worthwhile experience. Text is simple and repetitive, perfect for a younger preschool audience who might just be learning to share themselves. Simple and tender, this book delivers a powerful message without being didactic. 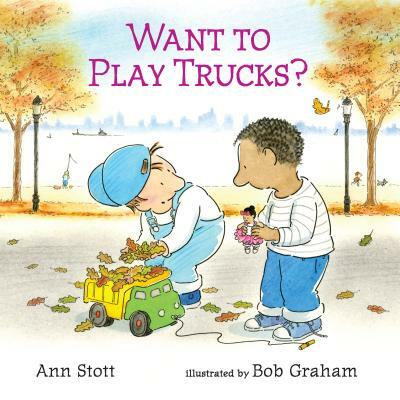 A welcome addition to the collection of picture books that challenge gender stereotypes. A first purchase for one-on-one and small group sharing. Graham, who's illustrated books on sensitive topics before, is the perfect choice for this one. His kid-friendly artwork portrays the dynamics of young childhood play in ways both realistic and fun. In both pictures and words, a smart take. With breezy, expressive illustrations by Bob Graham, the book demonstrates, in a way that feels unforced, true, and timely, how different modes of play, of expression, of preference don’t have to divide us.